Hustle’s Thoughts: I think today marks the exact one year anniversary of their trade last year (the Sonny Gray, Miggy, Bellinger deal) and my how the tables have turned (180 degrees). The deal itself is pretty similar to last years, just a lot less pieces ( I believe 10 players were involved last year). Anyway Bailey and Ferns being in a trade makes it very easy for me to rip on one of them, but truth be told it’s pretty reasonable. I think a healthy Stanton at $74 is probably a very good value and someone Bailey would have no problem keeping at that price, or even $10 more. Problem is the obvious, health. Chances are if Ferns is out of this in a month or 2 he runs the risk of Stanton being hurt and having to make a difficult decision in the offseason or take less. 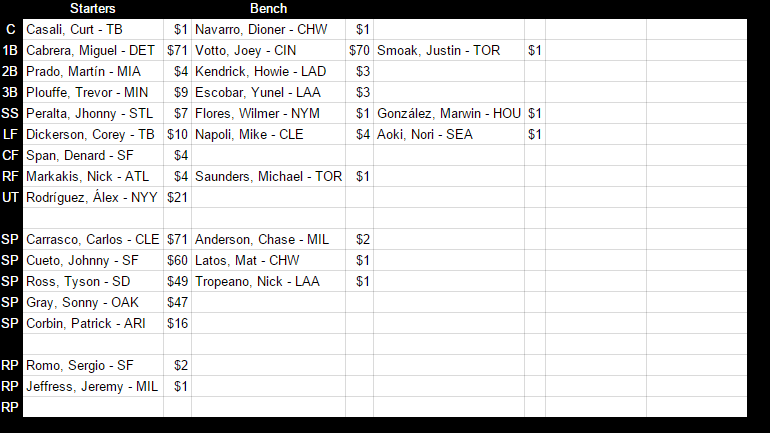 Timing wise, it’s a pretty good time to trade Stanton if you’re a seller and can get a haul. The Haul. In terms of the pick, who knows. Per Joe Rawlings the draft is weak this year and this is likely to be a pick somewhere between 10-16. That being said, there’s always going to be a good player to grab and this lottery ticket puts you in a position to get one. Nick Senzel (.124 ISO .350 WOBA 2017) seems like a good prospect. I don’t think he has the offensive upside of a Stanton, but he seems to be a lock to make the majors by next season at the latest and be the future 3b for the Reds. Currently Ferns has Ryon Healy and Maikel Franco, both are pretty young. I guess the hope is one of these guys will break out and be their sure fire 3b or they could all be just solid 4.5 ppg producers. Senzel will obviously be the cheapest one to carry next year at 0 or $1. Blake Snell: Snell was an early pick in last year’s inaugural prospect draft and I believe Bailey traded into the first round to get Snell. Currently he’s averaging just under 16 points a start. His HR/9 is up, his K rate is down, but he’s young. Playing in the AL East will do him no favors but the ballpark should contain some damage. I’m not sure we know how much Snell will cost next year, but I can’t imagine it will be that much at the rate his season is going. If one of these three assets hit big, then it’s a good haul for Ferns, but we won’t likely know for a while, and in the meantime his team is considerably worse without Stanton. All in all, I see this as a Ferns getting 3 interesting pieces for one of the best bats in the game. One wonders if with Stanton gone if Miggy will stay put on PDS. After all, Ferns now has the overwhelming amount of budget space to keep Miggy and then some. In fact, he could probably look to add a piece with the budget he’s created. Perhaps Giancarlo Stanton on 5/11/2018?